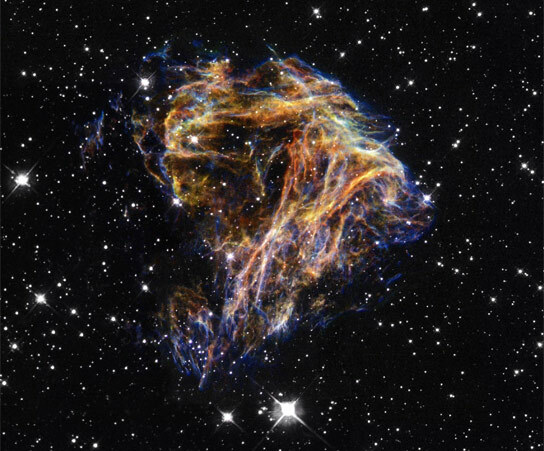 Hubble captures celestial fireworks within the Large Magellanic Cloud image courtesy of NASA Image Exchange. By observing a rare close pairs of stars, known as eclipsing binaries, a team of scientists recalculated the distance to the Large Magellanic Cloud, refining the uncertainty in the distance to the LMC down to 2.2 percent and decreasing the uncertainty in calculations of the Hubble constant to 3 percent. Pasadena, California — A team of astronomers including Carnegie’s Ian Thompson have managed to improve the measurement of the distance to our nearest neighbor galaxy and, in the process, refine an astronomical calculation that helps measure the expansion of the universe. Their work is published March 7 by Nature. The Hubble constant is a fundamental quantity that measures the current rate at which our universe is expanding. It is named after 20th Century Carnegie astronomer Edwin P. Hubble, who astonished the world by discovering that our universe has been growing continuously since its inception. Determining the Hubble constant (a direct measurement of the rate of this continuing expansion) is critical for gauging the age and size of our universe. One of the largest uncertainties plaguing past measurements of the Hubble constant has involved the distance to the Large Magellanic Cloud (LMC), our nearest neighboring galaxy, which orbits our own Milky Way. Astronomers survey the scale of the Universe by first measuring the distances to close-by objects (for example Cepheid variable stars studied by Wendy Freedman, director of the Carnegie Observatories, and her collaborators) and then using observations of these objects in more distant galaxies to pin down distances further and further out in the Universe. But this chain is only as accurate as its weakest link. Up to now finding a precise distance to the LMC has proved elusive. Because stars in this galaxy are used to fix the distance scale for more remote galaxies, an accurate distance is crucially important. The international collaboration worked out the distance to the Large Magellanic Cloud by observing rare close pairs of stars, known as eclipsing binaries. These pairs are gravitationally bound to each other, and once per orbit, as seen from Earth, the total brightness from the system drops as each component eclipses its companion. By tracking these changes in brightness very carefully, and also measuring the orbital speeds of the stars, it is possible to work out how big the stars are, how massive they are, and other information about their orbits. When this is combined with careful measurements of the apparent brightness, remarkably accurate distances can be determined. This method has been used before in taking measurements to the LMC, but with hot stars. As such, certain assumptions had to be made and the distances were not as accurate as desired. This new work, led by Grzegorz Pietrzynski of the Universidad de Concepcion in Chile and Warsaw University Observatory in Poland, used 16-years-worth of observations to identify a sample of intermediate mass binary stars with extremely long orbital periods, perfect for measuring precise and accurate distances. The team observed eight of these binary systems over eight years, gathering data at Las Campanas Observatory and the European Southern Observatory. The LMC distance calculated using these eight binary stars is purely empirical, without relying on modeling or theoretical predictions. The team refined the uncertainty in the distance to the LMC down to 2.2 percent. This new measurement can be used to decrease the uncertainty in calculations of the Hubble constant to 3 percent, with prospects of improving this to a 2 percent uncertainty in a few years as the sample of binary stars is increased. 1 Comment on "Distance to the Large Magellanic Cloud Recalculated, Improves Hubble Constant"
Strange that they improved the accuracy without determining the value.